Let’s go through each and every one of the 9 matches that FC Barcelona has left to win the third Treble in the club’s history. Things are heating up. It was just a decade ago when FC Barcelona was winning the Treble under manager Pep Guardiola in an unprecedented event. Before the Catalan club, only Manchester United had been able to reach such an impressive feat in modern football. After the Blaugrana’s success, we had another two Trebles from Internazionale Milano and Bayern Munich. Suddenly after those two other Trebles in five years, Barcelona’s achievement didn’t seem as spectacular. But the Catalan club rose to the occasion again in 2015 when they won their second Treble in history with the Messi, Suarez, and Neymar trio. Now that a new season is close to its end, there is a major chance for the Catalan club to win their third Treble in history. We are going to take you game by game through the last 9 “finals” they will have to play in order to win this distinction again. A Treble hat-trick if you will. The next commitment will happen between FC Barcelona and Huesca at Alcoraz Stadium on Saturday. 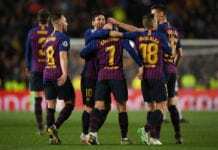 La Liga was pretty much decided last weekend when the Blaugrana defeated Atletico Madrid and only a tragedy would prevent them from winning the title. Up next we have Barcelona getting a visit from Manchester United in the return leg of the Champions League quarterfinal. This match against the Red Devils is the most complicated one yet because Messi and company will fight against their demons. Nothing guarantees that Barcelona will go through to the semifinals but the show must go on regardless of what happens next week. Up next we have the Catalan club getting another visit from Real Sociedad. A midweek fixture will have Barcelona visiting Deportivo Alaves three days after facing the Donostiarra. Barça gets a new visit from Levante on that same weekend before hypothetically playing the Champions League semifinals. The first leg of the competition will take place on April 29 against the winner of the Liverpool vs Porto quarterfinal. The Catalan club will travel to Balaidos after that to face Celta de Vigo in a very complicated away La Liga match. Two days after this trip, Barcelona will have to travel again in the second Champions League semifinal leg to either Liverpool or Porto for that ticket to the final at the Wanda Metropolitano. Once that ordeal is settled for the Blaugrana, they will have two consecutive La Liga matches before playing the Copa del Rey final. #UEFA son 7 clubes los que han conquistado el famoso “triplete” y el #FCBarcelona lo ha logrado 2 veces. The first of those two matches will take place at Camp Nou against Getafe on May 11. They will have to travel to Eibar in order to finish their commitments in La Liga and rest for a full week before playing against Valencia. The Copa del Rey final will happen at the Benito Villamarin Stadium on May 24. And finally, Barcelona will play the Champions League final at the Wanda Metropolitano if everything works out well for them in the competition. This is all just speculation because we don’t know if Manchester United will eliminate Barcelona next week. Getting defeated again in the Champions League quarterfinals is certainly a possibility for the Catalan club, especially against Manchester United. But dreaming is free and they are only nine possible matches away from winning another Treble. Those promises that Lionel Messi made at the start of the season are starting to come back to everybody’s memory. Everything that FC Barcelona does in every competition from now until the end depends on him. The Argentine knows that the burden rests on his shoulders and he is ready to take the challenge. However, there are many more players who should also take a step forward in the moment of truth. Is it possible for Barcelona to win the Treble again this season? Please share your opinion in the comment section down below.